Cambridge Steampunk IV: Now With Added Zombies! 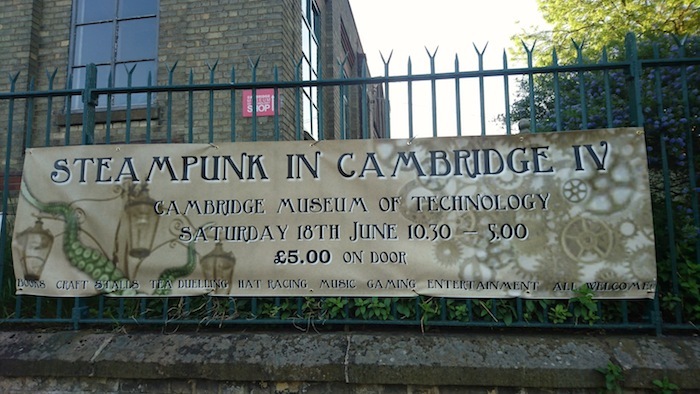 Steampunk returns to Cambridge on Saturday, June 18, 2016! 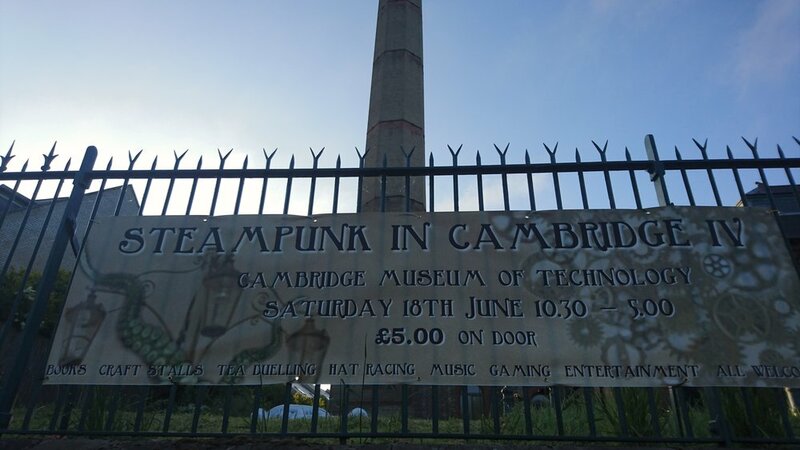 Steampunk in Cambridge returns for its fourth year! Download promo poster here and spread the word! 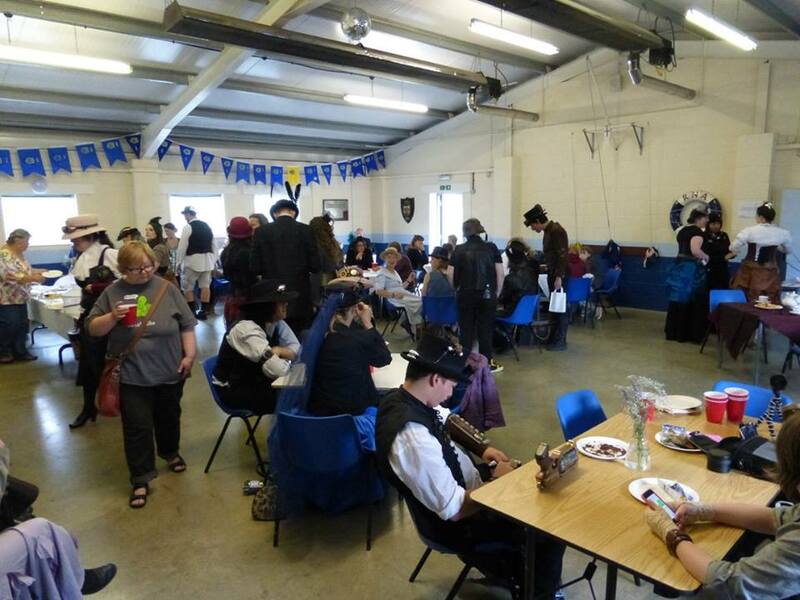 Stalls, genre book stalls, tea duelling, hat racing, music, gaming, entertainment, retro costumes and more! At 8.30pm in the Spackman Building, we have our resident mentalist Dr Corvus Marconi, a master of magic, mystery and is definitely not for the faint hearted! Steampunk is a genre that takes its inspriration from Victorian science fiction with its outlandish inventions and stories. Devotees clothe themselves in all manner of Victorian dress; from explorer to scientist to airship pilot and take great pride in constructing their own gadgets from junk shops and just about anything they can get their hands on. It harks back to an era of good manners, tea and biscuits and a good helping of self deprecating humour. A steampunk is always friendly, polite and eager to chat about what they do. You can see steampunk influences in Dr Who and in films such as the League of Extraordinary Gentlemen and Hugo. Hat racing involves propelling any sort of hat (apart from berets, as they are deemed far to revolutionary) around an assault course set by the organiser. Hats can be propelled by any sort of propulsion, such as radio controlled cars or hovercraft and the only type we ban are flammable rockets. Additional points will be given out for style and entertainment value. This sport originated from the fevered imagination of prominent Steampunks Dr Geof and Major Tinker. From it sprung the Honourable Association of Tea Duellists and it's official rulebook, as compiled by signatories of the Hague Convention 1899. It is a game of skill and nerve. In brief, the two combatants sit opposite one another with a hot cup of tea. (We shall be adhering to Cambridge Rules, that sprung from Street Tea Duelling, that stipulate black Earl Grey, hot). The Tiffin Master who oversees the ceremony commands them to "dunk" a Nice biscuit (the competition standard) in the tea for five seconds. On withdrawing the biscuit, the last person that manages to eat the biscuit whole without it falling apart, is the winner. If neither manages a clean "nom" the round is run again.